Book Review: Slaves of the Switchboard of Doom by Bradley W. Schenck + Book & Mug GIVEAWAY! This year seems to be setting the trend for retro-style reads making a comeback. Indeed, if you’re feeling nostalgic for the Golden Age pulps and the thrilling sci-fi classics of the past, then I think you’ll be quite happy with Bradley W. Schenck’s Slaves of the Switchboard of Doom, a rollicking mashup of the old and the new. Set in a future as imagined by “the world of tomorrow” in the 1939 World’s Fair, the story opens in the megacity of Retropolis, its art deco inspired skyline bestrewed with hover cars and monorail tracks. The hero of our tale is a freelance adventurer named Kelvin Kent, who is sometimes better known by his professional name of “Dash”. Soon, he finds himself hired by Lola Gardner, a woman representing a group of switchboard operators who have all just been fired from their jobs for reasons they don’t understand. Surely a large city like Retropolis with millions of people needing to communicate and access data on their InfoSlates would need the services of switchboard workers to keep on running, which means that another system must have sprung up to take their place, and Lola would like Dash to figure out who is behind this mysterious plan and why. Enter Howard Pitt, a civil engineer whose obsession with efficiency has consumed him to the point of madness. No one is quite sure what he is up to, but for some reason he has been buying up vast amounts of inertium, a metal prized for its gravity-defying properties and use in the production of flying cars and personal jetpacks. A transport official named Abner Perkins in on the case, trying to track down where these inertium supplies are going and what Pitt might be trying to do with them. Meanwhile, a silent and unassuming automaton named Rusty comes across the discarded remains of another robot in an alleyway—except unlike all other robots in Retropolis, this one had been constructed with no legs. Troubled and angered by this discovery, Rusty enlists the help of his friend Harry Roy to find out why anyone would design and create a legless robot and for what nefarious purpose. As these various investigations come together, a conspiracy starts to take shape, one that will pit all our heroes against a strange and altogether unexpected threat. I’ve said it before and I’ll say it again—I love books like these because of the passion behind them. Like most homages to the classic science fiction adventures of the 1920s to 1950s, Slaves of the Switchboard of Doom was clearly written for fans by a fan. The story wears its pulp era-inspired roots on its sleeves proudly, riffing on genre tropes with an eye towards faithfulness and good-natured humor. The world and characters are also a testament to Schenck’s familiarity with and enthusiasm for the source materials from which he drew his vision, and this is further confirmed by the author’s own gorgeously rendered illustrations which fill these pages. Bringing Retropolis to life is perhaps the novel’s strongest achievement. Think ray guns and rocket ships. Pneumatic tube transports. An entire city district ruled by mad scientists where they are free to conduct their dangerous experiments and build whacky inventions. It’s a zany mix of modern technologies fused with the old-fashioned, as illustrated by examples like the tablet-like InfoSlate devices that relay information via the manual efforts of switchboard operators instead of the internet. And of course, the robots of Retropolis also deserve a special nod, as no vision of retro-futurism can be truly complete without them. Sentient and intelligent, they play a significant role in this novel, with the actions of the robot characters influencing the direction of the story in crucial ways. The plot is also just plain fun. Though if I’m to be honest, there were perhaps a few sections I felt were excessively written or too disorganized and drawn out on account of all the different characters and frequent POV switches, but on the whole this is a fast-paced, energetic book. As one would expect, fans of Golden Age and pulp-era adventures will probably get the most out of it, but there is absolutely no prerequisite to enjoying the story. Granted, this particular style of storytelling and the author’s sense of humor can definitely be considered an acquired taste, but as long as you don’t mind the occasional moments of off-the-rails silliness, I think even a casual fan of sci-fi will be able to find plenty to like here. 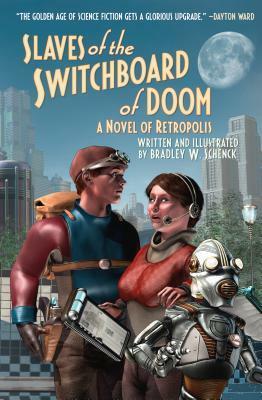 All in all, Slaves of the Switchboard of Doom was a delightful and entertaining debut by Bradley W. Schenck and I enjoyed every moment of my time spent in weird and wonderful Retropolis. The experience was made even better by the author’s stunning interior artwork (worth the price of admission alone, in my opinion), which made the people and places even more charming and the story even more atmospheric. As they say though, come for the nostalgia, stay for the adventure and mystery; if this sounds like something you’ll enjoy, you’ll definitely want to give this one a try. Interested in checking out Slaves of the Switchboard of Doom? Well, you’re in luck! 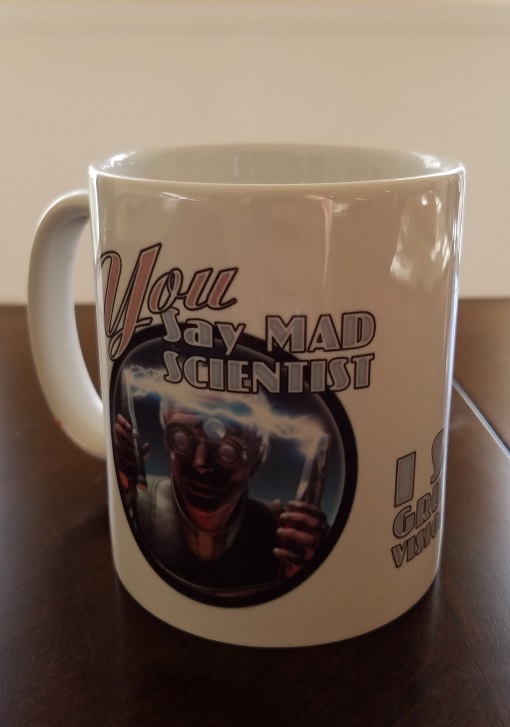 With thanks to the publisher, the BiblioSanctum is pleased to be hosting this amazing giveaway for a chance to win one hardcover copy of the book PLUS a cool graphic mug like the one you see in the photo! There are two versions available: “Ask Me About my Ray Gun” and “You Say Mad Scientist, I Say Grumpy Visionary” (pictured above). This giveaway is open to addresses in the US and Canada only. To enter, all you have to do is send an email to bibliosanctum@gmail.com with your Name and valid Mailing Address using the subject line “SWITCHBOARD OF DOOM” by 11:59pm Eastern time on Tuesday, June 20, 2017. If you have a mug design preference, please include this as well so the publisher will know which version to send should you win. Only one entry per household, please. The winner will be randomly selected when the giveaway ends and then be notified by email. All information will only be used for the purposes of contacting the winner and sending them their prizes. Once the giveaway ends all entry emails will be deleted. It’s so awesome! I love drinking out of it! That is a pretty cool mug. Tor was kind enough to send me one…I love it. What’s not to like about a little retro fun. Good luck to everyone with your giveaways. Oh my gosh I LOVE that title! And pneumatic tube transports? Jetpacks and hover cars?? I’m in. I love the whole art deco- retrofuturist thing.